To be successful, smoke-free policies need community participation – not just consultation – in their development. Policies that have local ownership and commitment are more likely to be followed. There is also evidence that introducing smoke-free policies in the workplace can lead to increased support for smoke-free spaces in other areas such as smoke-free homes and cars. Successful smoke-free workplace policies also result in more workers wanting to quit. Combining locally owned smoke-free policies with access to quit support services increases the success of these policies. 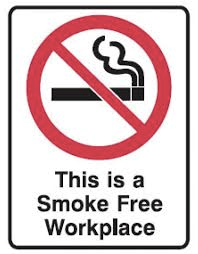 Working in an environment with a smoke free policy can also encourage individuals to quit. Here are some quick tips on setting up a smoke-free environment: How to set up a smoke free environment. provides: advice on how to begin the process; templates for worker consultation; and templates to assess how much smoking happens at work. Second-hand smoke is also believed to contribute to the risk of sudden infant death syndrome (SIDS). Less well known, but probably just as harmful is third-hand smoke. Third-hand smoke is the tobacco smoke toxins from second-hand smoke that get into a smoker’s hair and clothes and build up on surfaces and dust in areas where people smoke. Evidence shows that these toxins stay in homes and cars for a long time after the cigarette has been extinguished, even several months later. They may even become more toxic over time. Third-hand smoke is an emerging area of research and we don’t yet understand all the health hazards. However, children (especially infants), are more vulnerable to third-hand smoke toxins. This is because infants crawl over contaminated floors and mouth contaminated surfaces like furniture and toys. We also know that infants consume up to a quarter of a gram of dust every day. That’s twice as much as adults. There is good evidence that having a smoke-free home and car improves children’s health. There is also some evidence that keeping the home smoke-free helps to prevent uptake of smoking by young people. There are therefore many good reasons to support people to have smoke-free homes and cars. A recent review found that intensive counselling methods or motivational interviewing with parents to be most effective for reducing children’s tobacco smoke exposure in the home. There is some indication that school-based education, intensive home visits, brief education provided to parents in clinics (including scheduled children’s health checks) and culturally sensitive health promotion brochures may also help reduce second-hand smoke in the home and car. Menzies School of Health Research has developed Healthy starts: reducing the health effects of smoking around Indigenous babies and children, a resource to support health providers when discussing second-hand tobacco smoke with families, and to encourage families to have smoke-free homes. Any opportunity to reduce second-hand smoke is a good investment because there is no safe level of exposure to second-hand smoke, and smoke-free events both denormalise smoking and encourage people to think about quitting. Furthermore a recent survey, Talking About The Smokes (TATS) found that support for smoke-free festivals and events is strong in Aboriginal and Torres Strait Islander communities, particularly among those who don’t smoke: for never smokers, support was 71%, for ex-smokers 65%, and for non-daily smokers 70%. Half of all daily smokers were in favour of smoke-free events (51%). Pledging to be smoke-free demonstrates an active commitment and motivation to change. Evidence shows that when someone makes a public declaration (pledge) they are more likely to follow through with that promise, both for themselves, but also because of what others might think of them if they don’t maintain their promise. We also know that people are more likely to stick with a commitment that has real value, purpose and meaning to them. as well as supporting behaviour change, pledges can be used to monitor an activity’s reach and impact.